Finally, we have had a matchup that didn't come to the last tense few seconds. Barrichello has easily stripped di Grassi of a chance of winning the Sidepodcast Character Cup this year. Now we must move on to our fourth pairing, and we shall see if this one will be a walkover, or another close battle. Button is making the most of his time at McLaren - a move that baffled both fans and paddock insiders at the start of the season. However, his partnership with Hamilton is working out well, especially compared to the struggling Red Bull team. Generally a happy chap, Button has been known to let the pressure get to him occasionally, but he can usually be relied upon for an honest and frank interview, and plenty of great PR stunts, when required. 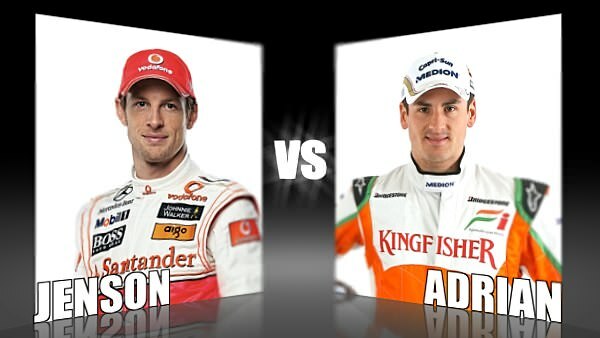 Sutil has been around in F1 for a while now, and still hasn't made a huge impression on the sport. With Force India starting to move forward, we should see more of the German, and find out more about him than that he used to play the piano. From a character standpoint, he seems pretty calm even when things go wrong, generally quite philosophical. He's also not scared to take on Trulli.